Over two years has passed since American Farm Bureau Federation (AFBF) led an industry coalition to address issues of surrounding ag data ownership, privacy, and security. When AFBF published the "Privacy and Security Principles for Farm Data"--or as I call them, the ag data's "Core Principles," I expected the industry uptake to be swift. Companies enthusiastically signed on. But here we are, two years later, and many ag tech providers still do not get it--ag data is not just 1s and 0s, but proprietary information that should be grounded in an ownership principle. Ownership: We believe farmers own information generated on their farming operations. However, it is the responsibility of the farmer to agree upon data use and sharing with the other stakeholders with an economic interest, such as the tenant, landowner, cooperative, owner of the precision agriculture system hardware, and/or ATP etc. The farmer contracting with the ATP is responsible for ensuring that only the data they own or have permission to use is included in the account with the ATP. You could break this down into a few parts. First, the general principle is that farmers own the data created on their farms. Second, there are multiple stakeholders that may have an interest in the farmer's data when using online platforms. Third, farmers are responsible for making sure the data they upload is theirs, or used by permission. This ownership principle is fairly straightforward. "Ownership" as a legal concept is more complicated. You can only own something if the law recognizes that an ownership right. "Ag Data" is not a traditionally recognized type of property, subject to ownership. In the US, our laws recognize ownership of real property (land), improvements (buildings), personal property (goods), and even animals. Ag data is none of these. US laws also recognize ownership of "intellectual property" or "IP" in a few instances. You can own a patent on a new invention. You can own a trademark or service mark. You can own a copyright in an original literary, musical, theatrical or other creative work. Ag data doesn't fit into these traditional IP classifications. Information, including a formula, pattern, compilation, program, device, method, technique, or process, that: (i) derives independent economic value, actual or potential, from not being generally known to, and not being readily ascertainable by proper means by, other persons who can obtain economic value from its disclosure or use, and (ii) is the subject of efforts that are reasonable under the circumstances to maintain its secrecy. In short, a trade secret is something that only the farmer knows, that has economic value to the farmer, and that another person could not easily identify or reverse engineer. Not all ag data fits this definition. Not all ag data are protected trade secrets. But clearly some ag data is the type of information that a farmer considers his or her trade secret. The other option for recognizing ownership in ag data is legislative. Congress could enact laws that protects ag data, prohibiting copying or distributing without a farmer's consent. Congress has done this medical data, for example (HIPAA). But nothing like this exists for ag data. 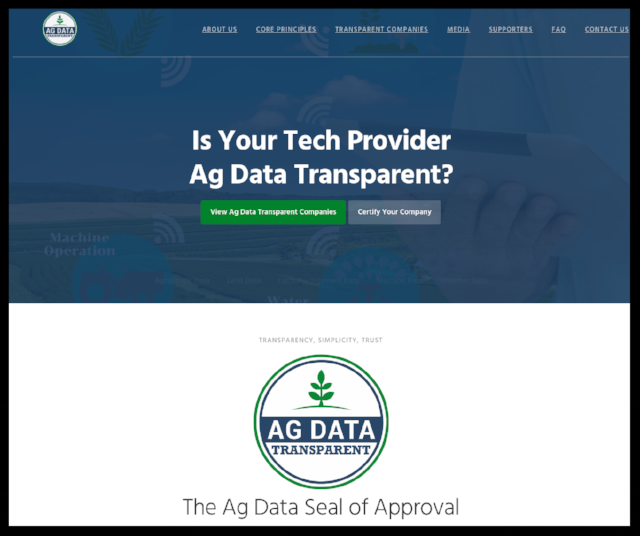 The Ag Data Transparent website verifies companies that follow the Core Principles. All of this points to one fact. Whether a farmer owns his or her data after transferring it to a cloud-based platform is dependent on the contracts the farmer signs with the provider. If the contracts do not treat ag data as a protected trade secret, saying the farmer owns their data is an empty promise. Ownership means nothing if the farmer has no control. Before signing up for an ag data platform, farmers should ask what the provider's position is on ag data ownership. Farmers can also look on the Ag Data Transparent website and see how the provider answered that question when under review. If the provider is not "Ag Data Transparent" certified, farmers should ask why.